I remember reading this saying years ago and it’s stayed with me all this time. Whenever someone has hurt me, I remember back on these words and try to find a way to move on and release the hurt. I am a firm believer in setting boundaries. 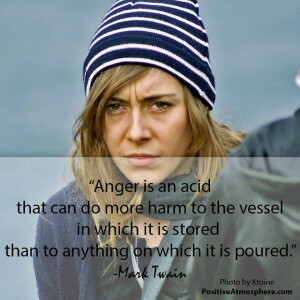 Anger is an “indicator” emotion and it gives us information: that certain behaviors in certain people are unsafe. If, when confronted, the person refuses to change or acknowledge the behavior, it’s time to set some healthy distance between ourselves and that person and to “remove the door mat” so we don’t get taken advantage of and walked on again. After that has been done, however, we need to find a way to feel compassion in our hearts for that person’s obvious wounding and to send well thoughts their way. Not just for them, but for us. Because anger releases very toxic chemicals into our bodies that harm us. They harm our bodies, they harm our emotions. We need to keep our softness, our wonder in the world, in humanity. Some people change and relationships are mended. Some people don’t and we grieve the loss. Give compassion and empathy to yourself for this loss as it is very real. Then set about for creating a garden paradise of love, peace and joy in your emotional environment and pull out the anger and resentment and vindictive weeds out of your garden so that they don’t choke out the good stuff. It’s a process and it takes time. But we need to drop the acidic emotions before they kill US.